Updated 2018-11-12 at 3:30PM with accessibility information. Beautiful.AI is a new website that enables users to create dynamic presentations quickly and easily with “smart templates” and other design optimized features. So far the service is free with a paid pro tier coming soon. I first heard about Beautiful.AI in an advertisement on NPR and was immediately intrigued. The landscape of presentation software platforms has broadened in recent years to include websites like Prezi, Emaze, and an array of others beyond the tried and true PowerPoint. My preferred method of creating presentations for the past couple of years has been to customize the layouts available on Canva and download the completed PDFs for use in PowerPoint. I am also someone who enjoys tinkering with fonts and other design elements until I get a presentation just right, but I know that these steps can be time consuming and overwhelming for many people. 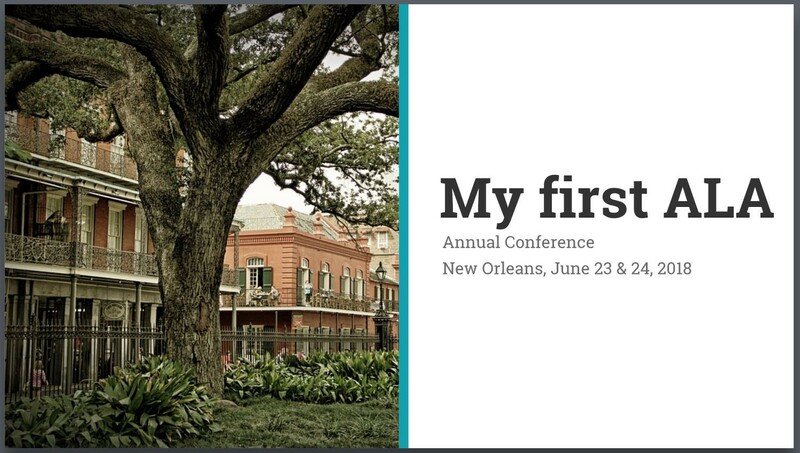 With that in mind, I set out to put Beautiful.AI to the test by creating a short “prepare and share” presentation about my first experience at ALA’s Annual Conference this past June for an upcoming meeting. A title slide created with Beautiful.AI. To help you get started, Beautiful.AI includes an introductory “Design Tips for Beautiful Slides” presentation. It is also fully customizable so you can play around with all of of the features and options as you explore, or you can click on “create new presentation” to start from scratch. You’ll then be prompted to choose a theme, and you can also choose a color palette. Once you start adding slides you can make use of Beautiful.AI’s template library. This is the foundation of the site’s usefulness because it helps alleviate guesswork about where to put content and that dreaded “staring at the blank slide” feeling. Each individual slide becomes a canvas as you create a presentation, similar to what is likely familiar in PowerPoint. In fact, all of the most popular PowerPoint features are available in Beautiful.AI, they’re just located in very different places. From the navigation at the left of the screen users can adjust the colors and layout of each slide as well as add images, animation, and presenter notes. Options to add, duplicate, or delete a slide are available on the right of the screen. The organize feature also allows you to zoom out and see all of the slides in the presentation. Beautiful.AI offers a built-in template to create a word cloud. One of Beautiful.AI’s best features, and my personal favorite, is its built-in free stock image library. You can choose from pre-selected categories such as Data, Meeting, Nature, or Technology or search for other images. An import feature is also available, but providing the stock images is extremely useful if you don’t have your own photos at the ready. Using these images also ensures that no copyright restrictions are violated and helps add a professional polish to your presentation. The options to add an audio track and advance times to slides are also nice to have for creating presentations as tutorials or introductions to a topic. When you’re ready to present, you can do so directly from the browser or export to PDF or PowerPoint. Options to share with a link or embed with code are also available. While intuitive design and overall usability won’t necessarily make or break the existence of a presentation software platform, each will play a role in influencing whether someone uses it more than once. For the most part, I found Beautiful.AI to be easy and fun to use. The interface is bold, yet simplistic, and on trend with current website design aesthetics. Still, users who are new to creating presentations online in a non-PowerPoint environment may find the Beautiful.AI interface to be confusing at first. Most features are consolidated within icons and require you to hover over them to reveal their function. Icons like the camera to represent “Add Image” are pretty obvious, but others such as Layout and Organize are less intuitive. Some of Beautiful.AI’s terminology may also not be as easily recognizable. For example, the use of the term “variations” was confusing to me at first, especially since it’s only an option for the title slide. The absence of any drag and drop capability for text boxes is definitely a feature that’s missing for me. This is really where the automated design adaptability didn’t seem to work as well as I would’ve expected given that it’s one of the company’s most prominent marketing statements. On the title slide of my presentation, capitalizing a letter in the title caused the text to move closer to the edge of the slide. In Canva, I could easily pull the text block over to the left a little or adjust the font size down by a few points. I really am a stickler for spacing in my presentations, and I would’ve expected this to be an element that the “Design AI” would pick up on. Each template also has different pre-set design elements, and it can be confusing when you choose one that includes a feature that you didn’t expect. Yet, text sizes that are pre-set to fit the dimensions of each template does help not only with readability in the creation phase but with overall visibility for audiences. Again, this alleviates some of the guesswork that often happens in PowerPoint with not knowing exactly how large your text sizes will appear when projected onto larger screens. A slide created using a basic template and stock photos available in Beautiful.AI. One feature that does work really well is the export option. Exporting to PowerPoint creates a perfectly sized facsimile presentation, and being able to easily download a PDF is very useful for creating handouts or archiving a presentation later on. Both are nice to have as a backup for conferences where Internet access may be spotty, and it’s nice that Beautiful.AI understands the need for these options. Unfortunately, Beautiful.AI doesn’t address accessibility on its FAQ page nor does it offer alternative text or other web accessibility features. Users will need to add their own slide titles and alt text in PowerPoint and Adobe Acrobat after exporting from Beautiful.AI to create an accessible presentation. Beautiful.AI challenged me to think in new ways about how best to deliver information in a visually engaging way. 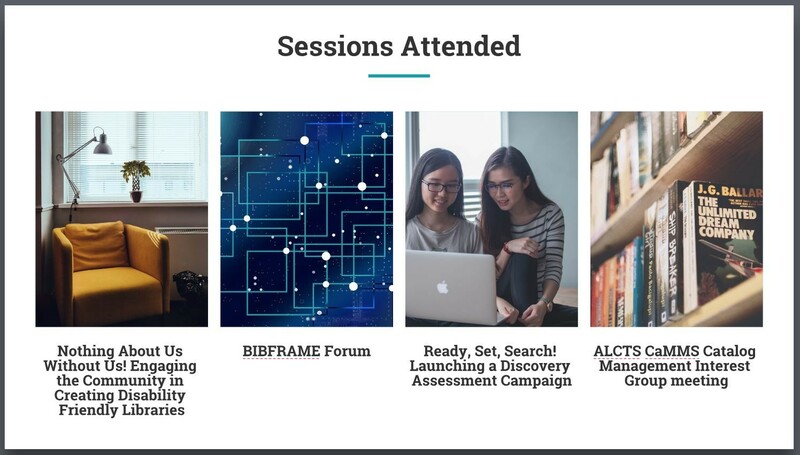 It’s a useful option for librarians and students who are looking for a presentation website that is fun to use, engaging, and on trend with current web design. 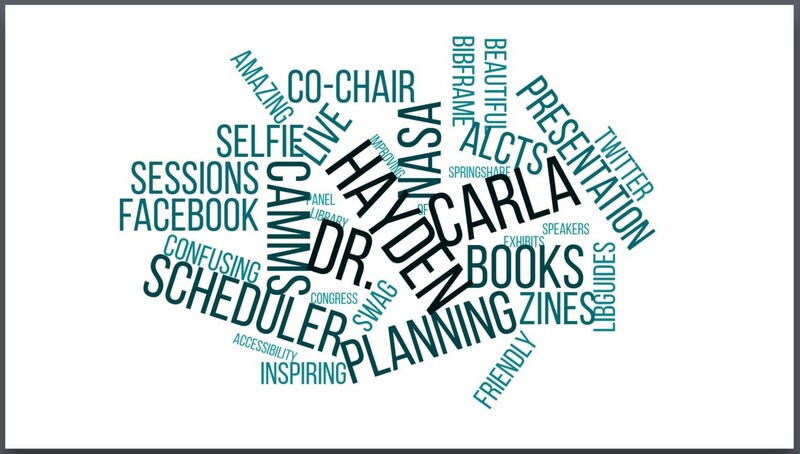 Click here to view “My first ALA”presentation created with Beautiful.AI. Jeanette Sewell is the Database and Metadata Management Coordinator at Fondren Library, Rice University. We had the fantastic experience of participating in the National Forum on Web Privacy and Web Analytics in Bozeman, Montana last month. 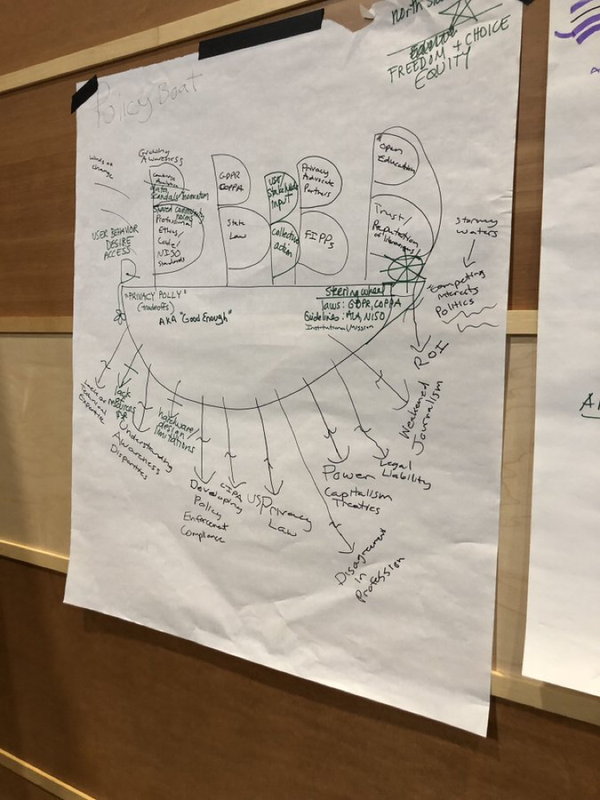 This event brought together around forty people from different areas and types of libraries to do in-depth discussion and planning about privacy issues in libraries. Our hosts from Montana State University, Scott Young, Jason Clark, Sara Mannheimer, and Jacqueline Frank, framed the event with different (though overlapping) areas of focus. We broke into groups based on our interests from a pre-event survey and worked through a number of activities to identify projects. You can follow along with all the activities and documents produced during the Forum in this document that collates all of them. While initially worried that the activities would feel too forced, instead they really worked to release creative ideas. Here’s an example: our groups drew pictures of boats with sails showing opportunities, and anchors showing problems. We started out in two smaller subgroups of our subgroups and drew a boat, then met with the large subgroup to combine the boat ideas. This meant that it was easy to spot the common themes—each smaller group had written some of the same themes (like GDPR). Working in metaphor meant we could express some more complex issues, like politics, as the ocean—something that always surrounds the issue and can be helpful or unhelpful without much warning. This helped us think differently about issues and not get too focused on our own individual perspective. The process of turning metaphor into action was hard. We had to take the whole world of problems and opportunities and come up with how these could be realistically accomplished. Good and important ideas had to get left behind because they were so big there was no way to feasibly plan them, certainly not in a day or two. The differing assortment of groups (which were mixable where ideas overlapped) ensured that we were able to question each other’s assumptions and ask some hard questions. For example, one of the issues Margaret’s group had identified as a problem was disagreement in the profession about what the proper limits were on privacy. Individually identifiable usage metrics are a valuable commodity to some, and a thing not to be touched to others. While everyone in the room was probably biased more in favor of privacy than perhaps the profession at large is, we could share stories and realities of the types of data we were collecting and what it was being used for. Considering the realities of our environments, one of our ideas to bring everyone from across the library and archives world to create a unified set of privacy values was not going to happen. Despite that, we were able to identify one of the core problems that led to a lack of unity, which was, in many cases, lack of knowledge about what privacy issues existed and how these might affect institutions. When you don’t completely understand something, or only half understand it, you are more likely to be afraid of it. 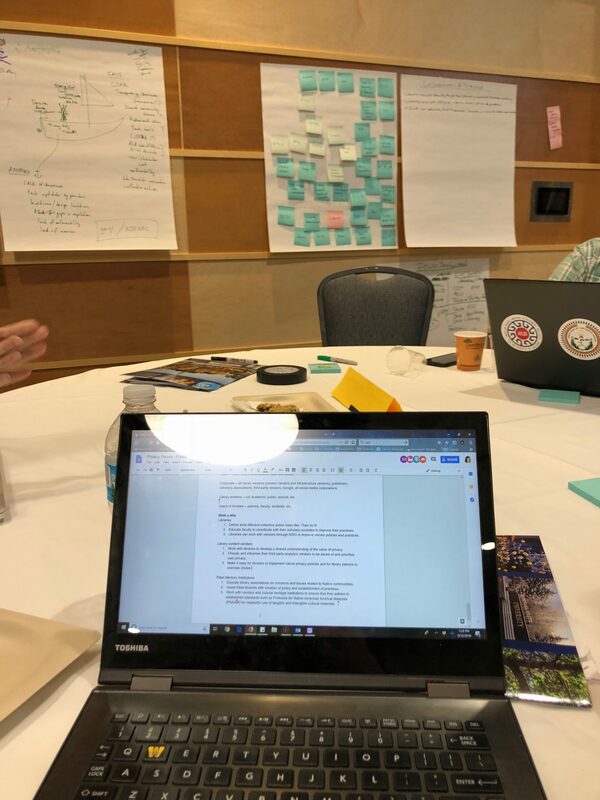 On the afternoon of the second day and continuing into the morning of the third day, we had to get serious and pick just one idea to focus on to create a project plan. Again, the facilitators utilized a few processes that helped us take a big idea and break it down into more manageable components. We used “Big SCAI” thinking to frame the project: what is the status quo, what are the challenges, what actions are required, and what are the ideals. From there we worked through what was necessary for the project, nice to have, unlikely to get, and completely unnecessary to the project. This helped focus efforts and made the process of writing a project implementation plan much easier. What the workday looked like. Writing the project implementation plan as a group was made easier by shared documents, but we all commented on the irony of using Google Docs to write privacy plans. On the other hand, trying to figure out how to write in groups and easily share what we wrote using any other platform was a challenge in the moment. This reality illustrates the problems with privacy: the tool that is easiest to use and comes to mind first will be the one that ends up being used. We have to create tools that make privacy easy (which was a discussion many of us at the Forum had), but even more so we need to think about the tradeoffs that we make in choosing a tool and educate ourselves and others about this. In this case, since all the outcomes of the project were going to be public anyway, going on the “quick and easy” side was ok.
For us, this three-day deep dive into privacy was an inspiration and a chance to make new connections (while also catching up with some old friends). But even more, it was a reminder that you don’t need much of anything to create a community. Provided the right framing, as long as you have people with differing experiences and perspectives coming together to learn from each other, you’ve facilitated the community-building. We’ve done a few screencasts in the past here at TechConnect and I wanted to make a new one to cover a topic that’s come up this summer: managing ILS updates. Integrated Library Systems are huge, unwieldy pieces of software and it can be difficult to track what changes with each update: new settings are introduced, behaviors change, bugs are (hopefully) fixed. The video belows shows my approach to managing this process and keeping track of ongoing issues with our Koha ILS.